Regardless of their diverse backgrounds, most Australians don’t want their beautiful, unique country turned into a giant quarry that would further poison the world with carbon pollution. 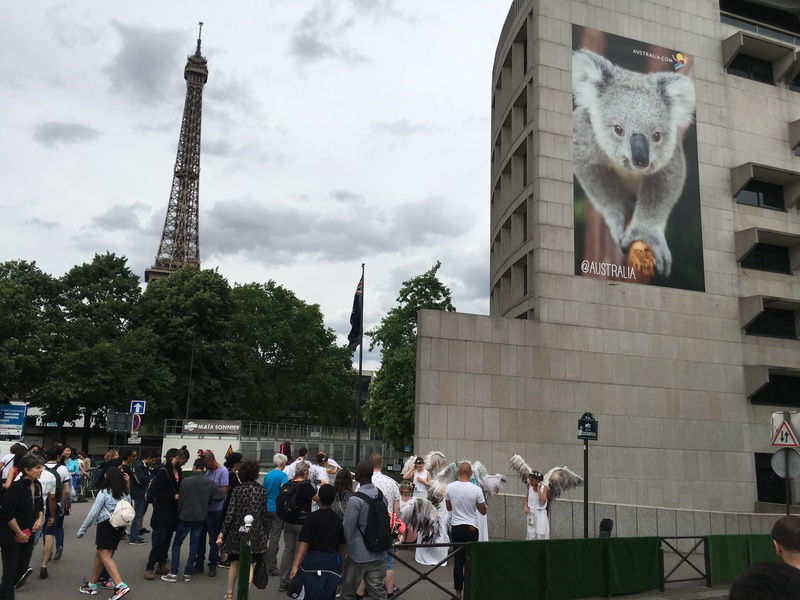 It was on their behalf—during the week before the 2016 Federal election—that Climate Guardians delivered strong messages to Australian embassies in London and Paris which served as key voting centres. 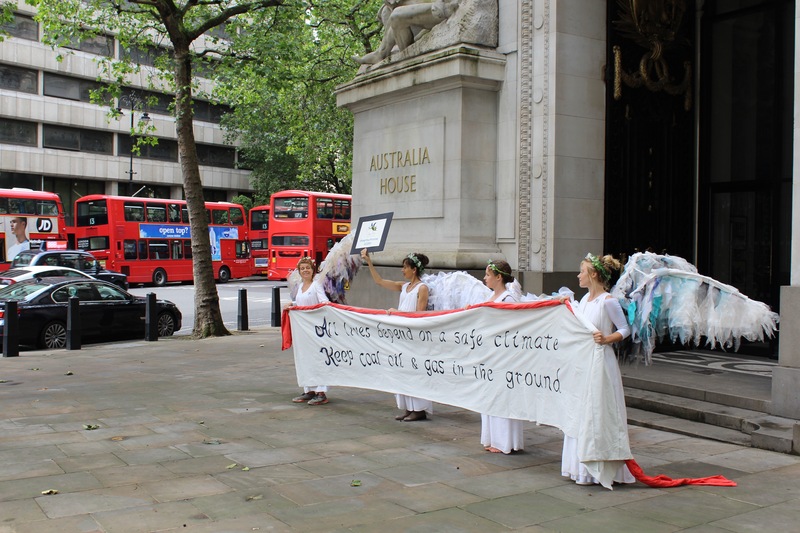 The first ‘visitation’ was early on Monday 27 June, the morning after the Climate Guardians’ weekend of performances for the Greenwich+Docklands International Festival. 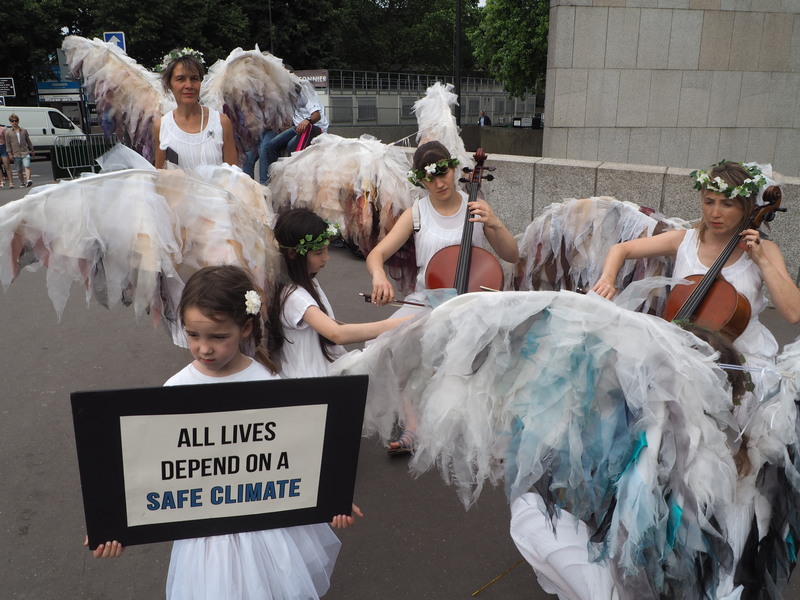 Carrying a hand-painted banner reading ‘All lives depend on a safe climate. 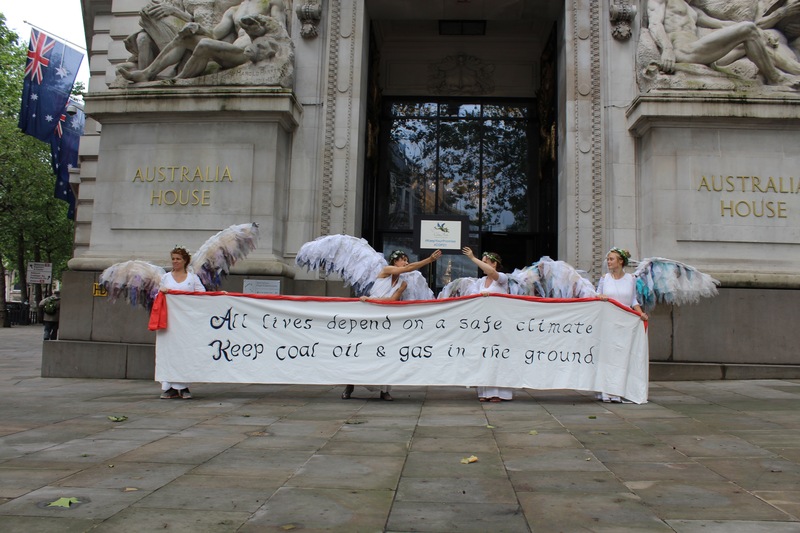 Keep coal, oil and gas in the ground’ four Australian Climate Guardians blockaded the main entrance to Australia’s embassy in London. Senior management were quick to respond with assurances that it was not our message that was a problem but rather that we were blocking the embassy’s entrance. It was hard to say whether we were in breach of any laws given that we were standing on public property. Nevertheless—with trains to catch early that afternoon—once we were satisfied that we’d strongly made our point and had plenty of images to prove it, we walked our banner through the streets down to the swollen banks of the Thames. As if that weekend’s Brexit vote hadn’t thrown people into enough disarray, flooding from extreme weather had thrown London’s tube into chaos. Still, making our way through the underground stations and streets of London we felt more than welcome and encouraged by local people’s enchanted responses. 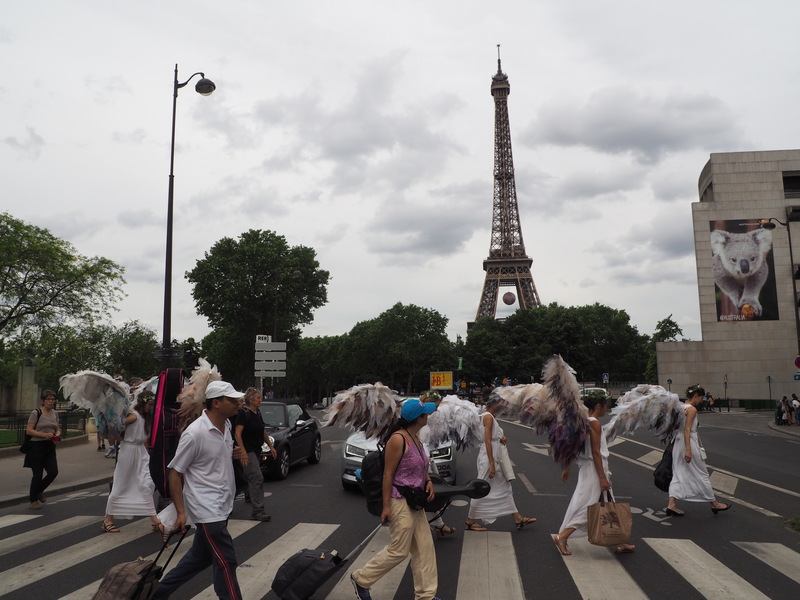 A few days later another flock of Climate Guardians manifested in Paris on 29th June. In recent weeks locals had been coping with major, costly disruptions as a result of the devastating deluge that struck France. In central Paris the River Seine rose six meters. As its banks burst nearby roads, parks and properties were submerged, forcing the closures of commuter lines and local businesses. In a race to safeguard precious artworks, The Louvre and the Musee d’Orsay closed their doors to move treasures out of their basements. It was another tough blow to a city still reeling from last November’s gruesome terror attacks. 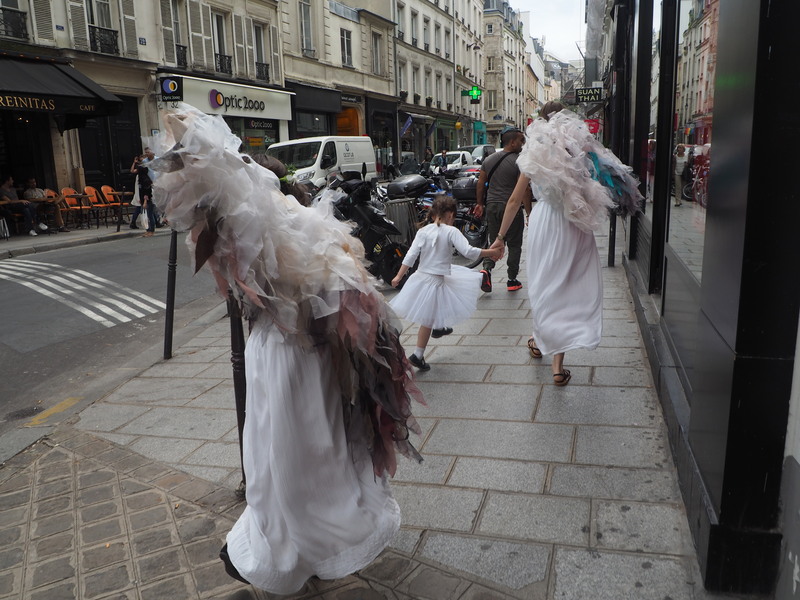 Having been not much more than six months since another flock of Climate Guardians was in Paris, it was touching that so many people recognised us on the streets and in the metro. On our way to the Australian embassy we were fortunate to bump into a group of Australian women who had already been there to vote. Some of them were familiar with our work and it was a pleasant surprise when they returned to actively join our demonstration. 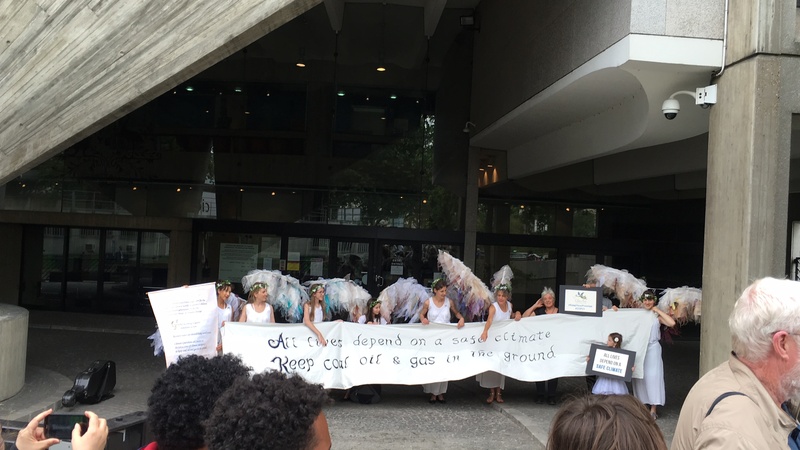 Presenting our banner ‘All lives depend on a safe climate. Keep coal, oil and gas in the ground’ at the entrance to the Australian embassy we were advised to leave the grounds of the embassy immediately. Defying these instructions for long enough to get some good images, we were in fact more than pleased to set up on the corner of the main road where we could engage with many more people, many of whom were on their way to or from the Eiffel Tower. To peoples’ delight three exceptionally talented Angel musicians played classical music on cello and viola. 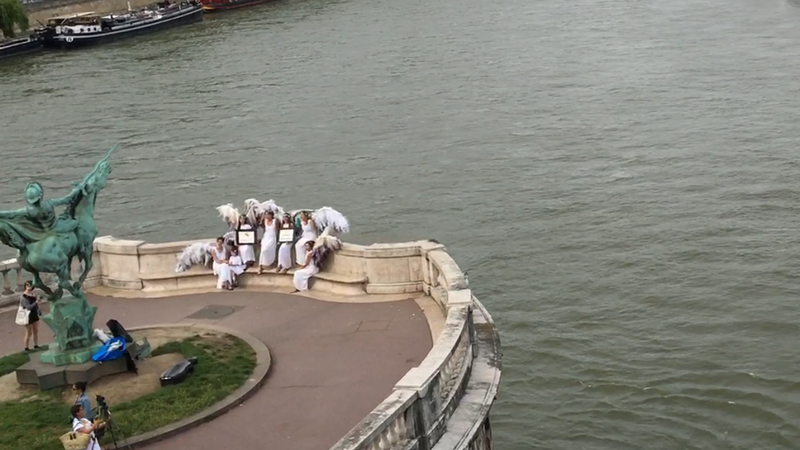 While the Angel musicians played a few Australian ‘Angels’ went in to the embassy to vote. Even without her wings the security guards weren’t quite sure what to do with the one dressed in white. After making a few calls they finally let her through to the voting section. Meanwhile, the spectacle outside had captivated a sports presenter from Sky Italia who took extensive footage promising to run it on his evening’s program. ‘I agree that this is critically important and this is such a beautiful way to express it. I just love this,’ said the aptly named Angelo. So what did we learn from our whirlwind experiences in the UK and Paris? At least everybody that we met was aware that climate change was devastating the globally iconic Great Barrier Reef and that the Australian government was failing in its role of caretaker. 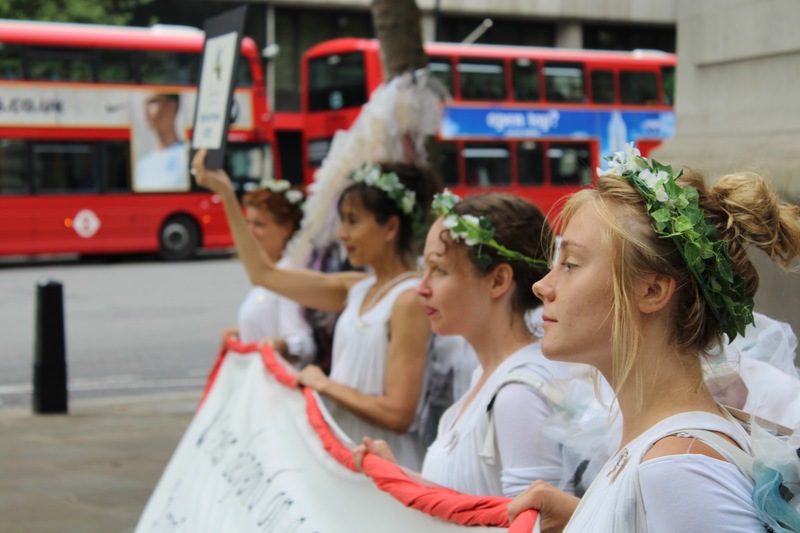 We were touched by strangers’ openness and felt deeply honoured and humbled working with dedicated, talented local ‘climate angels’, both in and out of costumes. Meaningfully engaging with the general public and working closely and tirelessly with new people prepared to generously give their time and talent is not only joyful it’s a demonstration of the sort of community leadership the world most needs now.